Mitsitam Cafe at the Smithsonian, Washington, D.C. The Mall in Washington, D.C. is arguably the centerpiece of our nation’s heritage, the showplace for many of our historic treasures, and a veritable culinary wasteland of previously frozen hamburger patties and chicken fingers. The museums and monuments are inspiring and humbling (and who can argue with free? ), but you’re bound to work up an appetite with all that walking. Unless you’re willing to jump in a taxi and zoom to a D.C. neighborhood off the Mall, for years your only option has been to eat in one of the terrible museum cafes. When there’s no competition, there isn’t any reason to try very hard—and they didn’t! It’s no surprise that the Smithsonian gave up some time ago and started filling their afterthought cafeterias with chain restaurants. The National Air and Space Museum, which is the world’s second most-popular museum after the Louvre, offers a McDonald’s, a Boston Market, and a Donatos pizzeria. While that’s certainly an upgrade from when I was a kid, I can’t help but think we could do a better job hosting the millions of international visitors who visit our national museums each year. 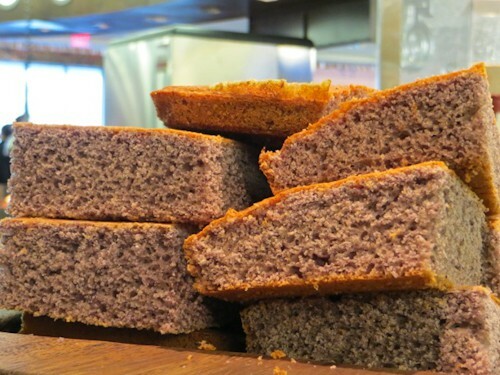 The National Museum of the American Indian, the Smithsonian’s newest addition in D.C., went (way way) back to the basics for Mitsitam Café, and they did such a good job that it’s worth visiting for the food alone. 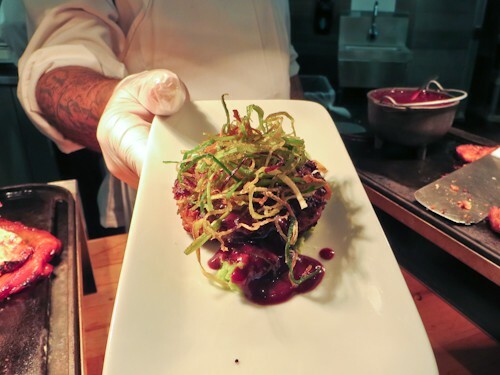 Mitsitam, which translates to “Let’s Eat” in the native language of the Delaware and Piscataway people, reinvigorates its menu with ingredients from the available harvest every solstice, but there are so many options that if you’re in the area you’ll want to visit more frequently than that. You pick up a cafeteria tray on your way in—an inauspicious beginning given my previous experiences at the Smithsonian—but that’s where the cafeteria comparison ends. Mitsitam features five buffet stations, each featuring native foods from a region across North and South America prepared with contemporary and traditional techniques. I knew as soon as I walked in that I would be back for lunch the second day, and I would have eaten there a third time if my trip lasted that long! From the piles of blue cornbread squares to the plump satchels of plantain- and chili-wrapped catfish, I wanted to try everything, which is dangerous because this place is not cheap. To experience a little bit of variety, you can get a side-dish sampler for about $13, but if you want to enjoy one of the fantastic entrées you’ll have to spend considerably more. I may have gone a little overboard, but my lunch each day of an entrée, a couple of sides, and a soda was just under $35. That’s what I will budget for my next trip too, because it’s worth every penny. 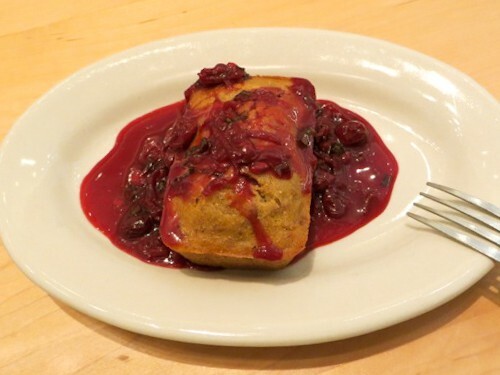 Cherokee bean bread with candied squash and cherry compote: Delightfully un-sweet, this sour and savory side dish looks like a dessert, but was a delightful way to start my meal. The bread was a dense, nutty cake that crumbled and sopped up the abundant tart cherry sauce. Purple corn and hominy salad with smoked jalapeno vinaigrette: Given the early season, hominy appeared in several side salads, and all of them were terrific. I loved the look of the purple corn in the otherwise white salad, and while it tasted fine, I was hoping it would taste a little more… purple. The real treat here was the (new to me) hominy, which had a palatable crunch that I never would have expected from corn. The kernels are much more swollen than typical cob corn and pop when you chew them. Hominy is a hearty veggie that I’m surprised I don’t encounter more often. The dressing offered just a little smoke and a hint of spice, neither of which overpowered the kernels. 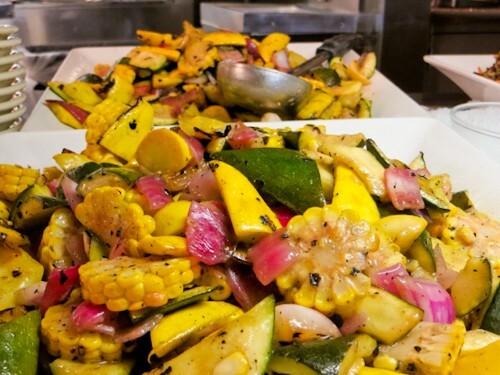 Grilled spring squash and corn salad with strawberry vinaigrette and toasted hazelnuts: Filled with large chunks of barely sautéed vegetables, the individual flavors held up well on the buffet. Slicing the corn cobs wheel-style was unexpected, but I liked the presentation and the flavor. The fruity dressing was another surprising addition: again nowhere near sweet, but the perfect subtle note to complement the bounty. Cherry and herb braised rabbit with fried leeks, fava bean puree, and red wine cherry reduction: I splurged on this one, which ran about $14 for a small crab cake-sized portion. The presentation was spectacular with swirls of cherry sauce decorating the long dish and architectural fried leek strings heaped on top. The pan-seared rabbit was moist and flavorful, somewhere between chicken and duck on the gamey scale, and paired well with the bold reduction. In addition to the above, I tried two scrumptious ceviches, a delicate fiddlehead salad, a woody cedar-smoked salmon, and much more—and I barely scratched the surface at Mitsitam. I can’t wait to return and eat and eat and eat! Safety tip: If you have a picky eater in your group and need to offer them some consolation to get them to come along, I’m sad to say you can get a beef burger or some chicken fingers and fries at one of the stations. I’m sure it’s a wise business decision given the number of food-phobic kids that come through each day, but once you arrive, do your best to get that picky friend to upgrade to one of the more exotic burger options, like buffalo, elk or duck. A word about the floors above the café: Unfortunately, the National Museum of the American Indian does its best work in the kitchen. The tribal exhibits upstairs have been compared to a banal trade show and a middle school science fair, and I reluctantly have to agree. Plan to pop up quickly between courses while you make room for round two! LeeMichael McLean is a frequent contributor to Good. Food. Stories., reporting on food finds from his travels far and wide. His passions include Lake Winnipesaukee, trying new restaurants, and complaining that he should be spending more time writing. LeeMichael, his partner, Bryan, and their son live in a farmhouse they renovated in Milton, MA.